Senator Brenda Hood, Parliamentary Secretary in the Ministry of Tourism and Culture led the Grenada delegation that brought a taste of Grenada to Trinidad & Tobago on Friday 9 May. In her address, Senator Hood emphasised the importance of regional tourism to Grenada, particularly from the Republic of Trinidad & Tobago. She spoke of the strong familial, cultural, and historical ties between our two countries. Spicemas 2014 launched at the Radisson Trinidad Hotel with two components, a Travel Agent Expo and a Media Launch. The Travel Agent Expo was attended by over 60 travel agents representing more than 40 travel agencies across Trinidad & Tobago. An interactive session provided opportunity for travel agents to meet one on one with officials from the Grenada Tourism Authority (GTA), the Spicemas Corporation (SMC), True Blue Bay Resort, Radisson Grenada Beach Resort, Spice Island Beach Resort, Blue Horizon Garden Resort and Caribbean Airlines. Former President of the Republic of Trinidad & Tobago, Professor George Maxwell Richards and his wife Dr Jean Ramjohn-Richards, Dr Lincoln Douglas, Minister of Arts and Multiculturalism and Senator Emmanuel George, Minister of Justice attended the Media Launch which delivered an authentic Grenadian cultural experience to all its specially invited guests. Boyzie, the current Soca Monarch and Road March King performed his latest hits, injecting pure energy into the event. 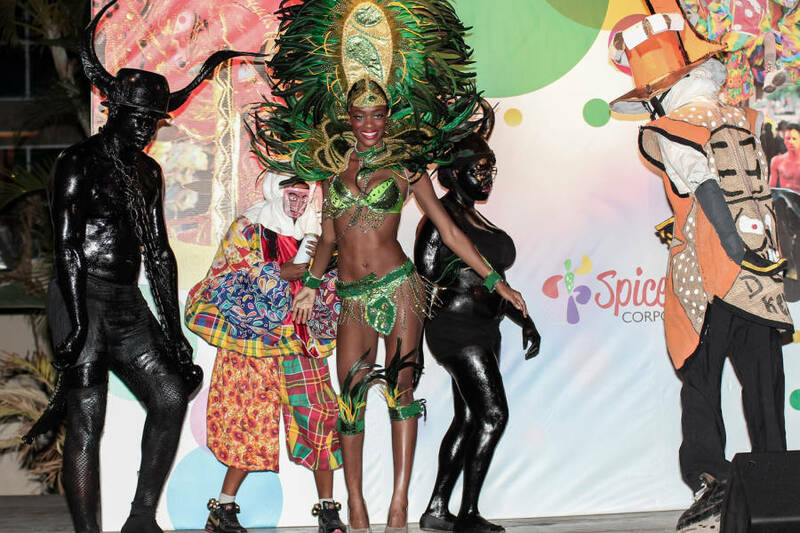 Traditional Vieux Croix (Vecco), Jab Jab, Wild Indian and Shortknee and costumed masqueraders in the carnival showcase. Christine Noel-Horsford, Manager of Projects and Reporting, delivered a detailed presentation on Grenada as a destination and its niche markets. This included reference to the new brand Pure Grenada: The Spice of the Caribbean, which was well received by the Trinidadian travel agents. Many of the travel agents present communicated to the Grenadian delegation that they were confident that Trinbagonians would travel to Grenada for carnival, while also indulging in the serenity of the tri-island state. The general response from the travel agents was that Grenada offers an experience that Trinbagonians crave. The GTA extends its thanks and gratitude to the Ministry of Tourism, Civil Aviation and Culture, Spicemas Corporation, Radisson Trinidad Hotel, LIAT Airlines, the Grenada Cultural Foundation, Caribbean Airlines, the Grenada Hotel & Tourism Association, True Blue Bay Resort, Radisson Grenada Beach Resort, Spice Island Beach Resort and Blue Horizon Garden Resort for their support and participation in ensuring that Spicemas Launch 2014 was a resounding success.